The first Thanksgiving took place back in 1621. It started as a three day festival to celebrate a successful harvest. A lot has changed from the first Thanksgiving to our modern celebrations of this national holiday in the United States. Over the years, we have established traditions within our families and as a nation that each have a special link to our past. The Minnesota Wild are at a crossroads this year in establishing a new tradition in St. Paul – a winning tradition. Before last season, the Wild were a struggling team that failed to qualify for the playoffs since the 2007-2008 season. This lack of success led to many high draft picks in the state of hockey. During these years, the Wild amassed an impressive stock of quality prospects. The club broke free from this losing pattern last season when the Wild qualified for the playoffs. With a lot of hockey yet to be played, the Wild are currently in the hunt to make the playoffs for the second straight season. The ultimate goal is to win a Stanley Cup title, but another organizational goal is to become a perennial playoff team and contender. The Wild’s success this year has put the club on the right track for creating a new identity in the state of hockey. Winning in the NHL is no easy task but the Wild have shown that they have the talent and leadership necessary to play consistent hockey. Minnesota will play five games between today and next Friday. Three of these games will be against the club’s Central Division rivals. Here is a look at the next week of games. This stretch will begin a crucial month in the season for the Wild as they work towards creating a winning tradition in the state of hockey. After a difficult 2012-2013 season, the Colorado Avalanche exploded out of the gate in the new Central Division. Under the leadership of head coach Patrick Roy, the Avs started the season with an 8-1-0 record. Colorado has been very impressive in the young season. 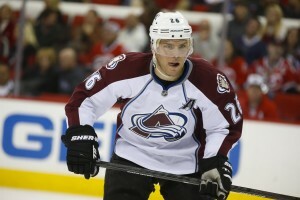 The Avs currently are challenging the Chicago Blackhawks and St. Louis Blues for the Central Division lead. Just as the Black Friday shopping rush reaches the dinner hours, the Wild and Avs will clash in a home-and-home series. The battle will begin at Xcel Energy Center in St. Paul on Friday night. This will be the first meeting of the season between the Wild and Avs. The action between these two clubs will continue at a second game at the Pepsi Center in Denver on Saturday night. The Avs have played .500 hockey in their last ten games posting a 5-5-0 record. After a tough 4-1 loss to the St. Louis in their last match, Colorado will look to bounce back in their next game against the Minnesota Wild. Forward Matt Duchene currently leads the team in scoring with twenty points. The Avs have a lot of young talent that is beginning to come to fruition. After a disappointing start and a coaching change, the Philadelphia Flyers have shown some signs of life in recent games. The squad has posted a 6-3-1 record in their last ten games. The Flyers will travel to St. Paul for this match on Monday night. 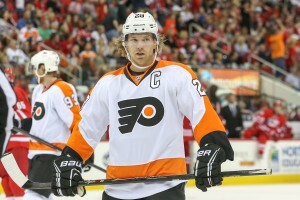 Forward Claude Giroux leads the Flyers with seventeen points where he’s scored three goals and tallied fourteen assists. Also at the top of the Flyers’ score sheet are forwards Brayden Schenn with fifteen points and Vincent Lecavalier who currently has fourteen points. An area of weakness for the Flyers has been the amount of penalties that the club has taken per game. The Flyers lead the league with 17.2 penalty minutes per game. With the Wild boasting a power play unit that is ranked among the top ten in the NHL, Minnesota will look to cash in on any power play opportunities. The Flyers play on the edge and this was most notable at the now infamous November 1st battle against the Washington Capitals. The Flyers lost this game by a score of 7-0 and a controversial fight broke out between goaltenders Ray Emery and Braden Holtby. The Wild have players who can match the Flyers’ physical play but this will be a close battle from start to finish. The Wild have split the season series with Chicago so far this season with a 1-1 record. Minnesota will have a chance at getting the upper-hand this week when they clash with the Blackhawks at home on Thursday. Chicago currently sits atop the Western Conference. The club currently has four players with more than twenty points on the season which include forwards Patrick Kane, Jonathan Toews and Patrick Sharp as well as defenseman Duncan Keith. 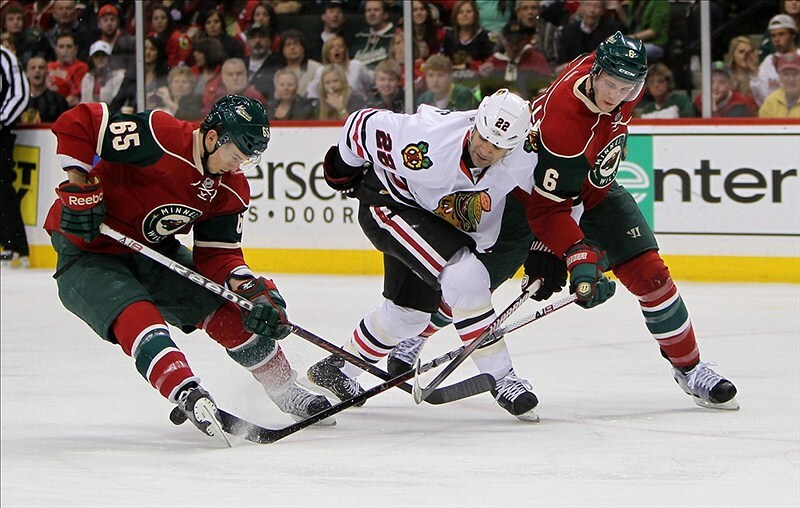 The matches between the Wild and Blackhawks so far this season have been high-octane offensive performances. Fourteen goals have been scored by the clubs in the two battles they’ve waged against each other this year. The Blackhawks won the first showdown in St. Paul by a 5-1 score and the Wild beat the Hawks in the Windy City by a 5-3 score. Chicago currently leads the NHL in goals scored averaging 3.54 goals per game. The Wild will need a solid defensive effort to counteract this high-powered offense. Jason Pominville has three of the Wild’s six goals against Chicago. Forward Mikael Granlund has also been productive as he’s tallied three assists and defenseman Ryan Suter has also notched two assists. Aside from playing a better defensive game against Chicago, another way they will need to improve to get the ‘W’ on Thursday is to cash in on their power play opportunities. The Wild have gone 1-8 on the power play against Chicago. This equates to a 12.5% efficiency which is well below their overall 21.1% power play efficiency on the season. The game on Thursday will be a chance for both clubs to get the upper-had in the season series. If the Wild are to be the winning team, they will need a solid defensive effort and they will need to make the most of their power play opportunities. Finally, the Wild will bookend the week after Turkey Day with a showdown in Columbus against the Blue Jackets. This will mark the first meeting of the season between Minnesota and Columbus. The Blue Jackets have also moved from the Western to the Eastern Conference. This game will also be the first match between these clubs as members of different conferences. The Blue Jackets are having a disappointing season so far. They currently sit in thirteenth place in the Eastern Conference. In their last ten games, the Blue Jackets have posted a 4-3-3 record. Columbus has won only four games at home this season at Nationwide Arena. The Wild have not had as much success on the road as they’ve had at home so Minnesota will look to change their fortune with a victory in Columbus. Defenseman James Wisniewski currently leads the Blue Jackets in scoring with eighteen points. Forward Ryan Johansen has sixteen points and forward Brandon Dubinsky has fifteen points on the season. A slight advantage that Columbus has over Minnesota is in their goals per game. Columbus currently averages 2.44 goals per game while the Wild average 2.38. As of today, Columbus has played one less game than the Wild but the club has managed to generate a bit more offense than Minnesota over the course of the season. Minnesota is entering a critical point of the season. The Wild will play fourteen games in December and eight of these games will be against Western Conference opponents. This month will be an important stretch for the Wild who look to gain ground in the playoff race. The Wild played without star forward Zach Parise in their last game against Phoenix. Parise suffered an injury against St. Louis but is expected to return to action in the near-term. Meanwhile, forward Mikael Granlund was placed on injured reserve by the Wild with what is being called an upper body injury. The ability to battle through adversity and still play consistent hockey is the mark of a contender. One strong suit for the Wild has been the depth the organization has acquired over the last few years. In battling through some key injuries, it will be interesting to see who steps their game up down the stretch. Minnesota’s ability to continue to play consistent hockey through times of adversity will be a crucial step down the path of establishing a winning tradition. The next week will test this ability while the club eagerly awaits the return of forwards Zach Parise and Mikael Granlund. If the Wild are to become a perennial playoff team, they will need to overcome situations like this and continue to play consistent hockey. The state of hockey is hungry for success and the next week provides an opportunity for the Wild to show that they are serious about establishing a winning tradition in St. Paul.